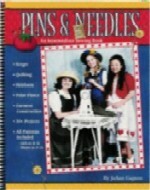 The intermediate book, Pins and Needles, continues what Stitches and Pins started, delving into more difficult sewing techniques like waistbands, zippers, and set-in sleeves. There are also sections on specialty fabrics, and you will learn the quick and beautiful seams and finishes made using the serger. The format of the book is laid out like Stitches and Pins, techniques are introduced followed by projects to apply the new techniques - from garment construction to quilting. There are over 30 projects in all, something to be stitched for every season of the year! And, all the patterns, Girls sizes 8 to 16 and Misses sizes 8 to 16, are included in a handy packet built into the back cover of the book!